We have brand new A-Stock 9002 manual treadmills for sale. This B-STOCK (Replaced Denise Austin non-motorized treadmills) TrimWalk Treadmill home fitness exercise equipment is a refurbished or returned unit which may have some small aesthetic scratches etc. It is a fully functional unit. If by chance you found anything missing or not functioning, email us and we will have the manufacturer ship you replacement parts or a replacement unit. Manual Operation on manual running treadmill Allows You to Set the Pace. Soft Deck Is Low-Impact, Is Easy on Joints. Unique Handrail Allows Freedom of Movement to Runners and Walkers of All Levels. Stays at a slight Incline. Full Function Electronics Include Speed, Distance, Time, Calories and Scan. These Treadmills Require One "AA" Battery (Not Included). Folding Treadmill Easily Folds Easily for Storage. Dimensions: 23"W X 42"L X 45"H.
Most customers who purchase a manual fold-up treadmill have similar reasons. 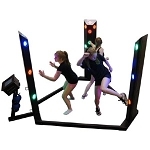 These customers are typically interested in having some piece of aerobic exercise equipment in their home, but do not have the money or space or both for an electronic treadmill. The manual foldable treadmill provides solutions for both problems by giving a customer both an economical piece of exercise equipment for their home while taking up a small fraction of the space and weight an electronic unit would take. Continue developing your home exercise plan with a Lifetime Basketball hoop. 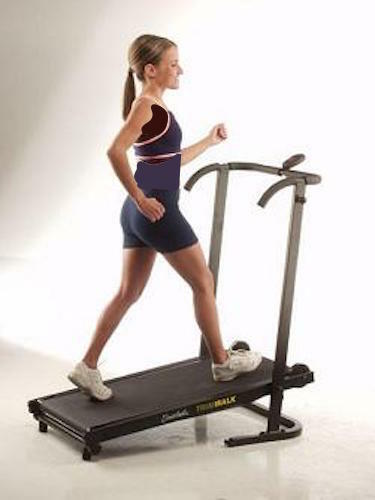 We also carry a great selection of Excerise Equipment including another model of Manual Treadmill. Item was in good condition, fast shipment, thanks. Excellent item, great service; will deal with seller again. Q: Will you be getting this back in stock? A: Unfortunately, that item has been discontinued by the manufacturer. Dimensions: 45" x 22" x 20"